My motorbike is not “reliable” in the classical sense. Or any sense actually. I usually travel with a full complement of tools to maintain hope I will get through any journey. Rarely, if ever, does the “expectation to arrive” exceed 80%. It is all part of the adventure on the old beast. On the Canada Day long weekend I went for a ride out to Slocan (for the Engineers Without Borders Western Retreat). I brought many tools and a variety of equipment to be ready to face whatever might come my way. I was not disappointed by the magnitude of the adventure. The journey began on Wednesday night. It was sunny in Vancouver as I left. There was a sprinkling fo rain in Abbotsford and I could see the clouds getting darker so I stopped and put on my rain gear. This consists of a rain coat, bib-style rain pants, and gaiters. I reached Chilliwack just as the road washed away. I did a U-turn and went zipping down the freeway the wrong direction (on the shoulder) to the last exit. My intent was to cross the bridge in Chilliwack over to highway 7 near Agassi. Apparently the slide was making news radio and the evening commuters were already being diverted. More lane splitting and shoulder riding eventually got me to the bridge. The torrential rain was not letting up. As I maneuvered my way through traffic one of the bolts on my windshield worked its way loose. It came off and hit me as I was darting around. I managed to straighten and secure the windshield without stopping (the remaining bolt held strong). The ~45 km from Chilliwack to Hope took me about two hours. By this time my rain gear had given up and I was drenched from the waist down. My boots were full. I nearly ran out of gas despite my time-saving driving tactics. I rolled into the fuel station in Hope having been running on the reserve portion of the tank for some time and the engine having just begun to sputter. I stepped into the tim hortons for some hot chilli to warm the bones. I did not bother taking off any of my wet gear as the rain showed no signs of letting up. While in line I overheard two men talking to each other (but directed at me I think) about the illegal activities of motorbikers. My only thought was “if you were stuck in a convertible with the top down, you would improvise too.” I kept my mouth shut. The rain stopped shortly before Merrit. As I ascended into the mountains I even climbed high enough for the sun to rise again. Watching the sun rise in the west is pretty cool. I used to see it all the time during late evening plane rides headed out for a skydive. I forgot how beautiful it is. In Merrit I found an empty parking lot and stripped down to my undies. The warmth radiating out of the pavement reinvigorated me. About 15 minutes later I put on dry woolies and got back on the road. I reached the home of Gunner near Vernon sometime after dark. Thursday morning I resumed my cruise out to the Kootneys. This day made the whole trip worthwhile. Gorgeous open roads and beautiful scenery. I stopped in Cherryville at the Triple Island Cheese Farm. 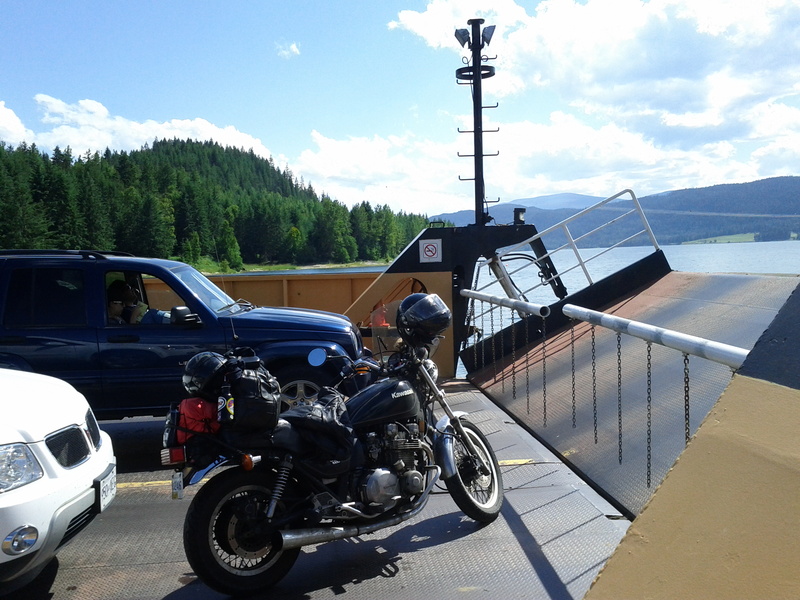 Next fuel stop and mobile phone coverage is in Nakusp, 140 km away, with a ferry ride at Needles, 80 km away. I made it 50 km before the bike died. The engine just stopped. The headlight would not even come on suggesting that it was an electrical issue. I unloaded the bike and went straight to the fuse box. Indeed one had blown. I swapped it for a spare and turned the key. The gauges lit up and everything looked good. Before starting the bike I proceeded to do a systems check: high beam, signals, brakes. Everything went dead again and I began the trouble shooting process. Usually troubleshooting means you try something and then see if things got better or not (or worse). In this case every time I was “wrong” in cost me a fuse. I quickly found myself sacrificing unnecessary systems to scavenge the fuse from that circuit. I managed to narrow the problem down to a specific part of the brake wiring just as I ran out of fuses. I decided that if I was truly confident I had found the problem and it had been eliminated, I didn’t need a fuse – I needed power. I broke off a piece of the cotter pin from the rear axle bolt and fashioned it into a “fuse”. 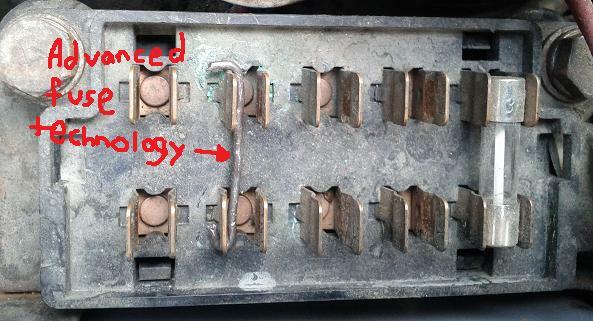 I bent it around the contacts in the now nearly vacant fuse box and turned the key. Smoke. Turn key back. I guess that is why you are not supposed to replace fuses with chunks of metal. I stood and contemplated for a moment and had another idea. Another quick adjustment to my jury-rigged wiring gave me renewed confidence. I turned the key again. No smoke. Gauge lights on. Systems check out. The bike starts! I am filled with smug glee. I grab a fist full of throttle continue the journey to the ferry. Fortunately the hardware store in Nakusp had fuses that were adequately compatible. At the fire base in Nakusp I was able to do a more professional job of my re-wiring, replace the cotter pin for my rear axle and procure a new bolt for the windshield. (Thanks Tess!) The next few days in Slocan were fabulous. Other than some issues with the drivetrain that have resulted in me taking the bike off the road permanently, there were no other problems on the trip and I got back to Vancouver that Sunday unscathed. This entry was posted in Adventures and tagged ewb, motorbike, Nakusp, Slocan, Tess. Bookmark the permalink. I’m glad I didn’t hear the whole story before you had our fourth-born as a passenger! Goodness, man, you do seem to live one big adventure. Glad you made it safely back home.